Hygiene counts whether it is now or after a major disaster. 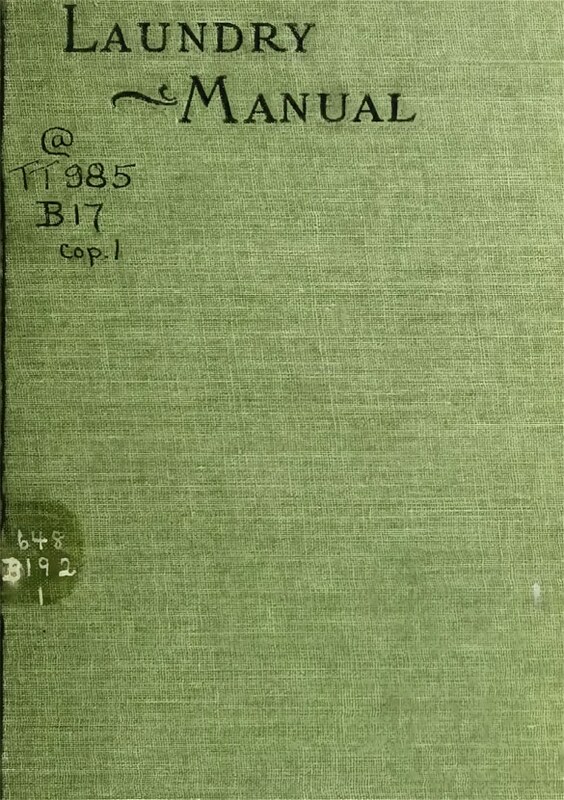 This is a 66 page manual written in 1902 that tells you how our ancestors cleaned their clothes. Now some of these methods may seem a bit strange by modern standards. They used things like homemade soaps, turpentine and kerosene, ammonia, lye and various other chemicals. The book contains recipes for making some homemade cleaning products. 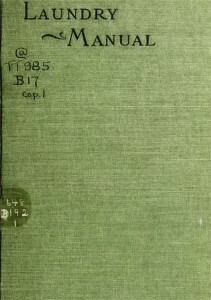 The book can be downloaded free at http://archive.org/details/cu31924003649559. This is a site maintained by Cornell University Library. Doing laundry, the way they suggest looks like a lot of work. The following is what is suggested for a home laundry in 1900. Set tubs, three or four. Clothes boiler (tin or copper). Heavy cloth for tubs and boiler. Small pieces of muslin and cheese cloth. blanket and fine cotton cloth. Bran in cheesecloth bags, 9×9 inches. As you can see, modern laundry products are definitely easier and safer to work with. If nothing else after reading this book, you will want to stock additional laundry products. How to Get Rid of Lice. This entry was posted in Sanitation and tagged laundry. Bookmark the permalink. While not as complex and probably not as effective as some of the chemical listed, My mother washed clothes in the 40’s and 50’s in an old wringer washer. She didn’t use detergent or Borax or washing soda. What she used was old fashioned lye soap (and some store bought bath soap). She would take the small pieces of soap left over after many baths and hand washing and put these into a mason jar that was kept topped off with water. On laundry day she would put about a 1/2 cup of this soapy water into the washing machine with hot water she heated on the stove. This unlikely mix of bath soapy water and hot water came alive when the washing machine agitator got into action. She would wash the light clothes first. Washing in this kind of machine was a matter of running it on the agitation cycle as long as it took to get them clean. Then she wrung the clothes out and set them aside. Sheets were next followed by towels and then the dirtier darks and work clothes. Each set of clothes went through an agitation cycle until they were clean. The same water was used for each set of clothes. Once all the clothes were washed the dirty water was pumped out and clean water filled the tub. Some water was heated on the stove to add to the mix because it helped the rinse cycle remove the lye soap which if rinsed by cold water would have left a residue. After a vigorous agitation the rinsed clothes went through the wringer. Sometimes a second rinse was required to get the soap out. Once all the laundry had been washed it was hung out on two long lines in the yard. The old wringer washers were virtually indestructible. A good electric motor, a transmission that would have powered a car and a set of rollers to wring out the clothes that got “most” of the water out of them. Laundry day was all day long and was a very physical job. We also had a scrub board. If you have never used a scrub board you need to understand that they were like magic. My mother would “fish out” clothes from the running washing machine and check for stains. These selected clothes would get a hand wring to get rid of excess water then to the large soapstone sink and the waiting scrub board. A little soap was rubbed on the back side of the stain (the side that would be rubbed against the scrub board) and the scrubbing began. miraculously the soap suds would be pushed through the clothes bearing the tint of the stain. A cup of water would be splashed on the area and usually the stain was gone. The article of clothing was returned to the washing machine and she would fish out a different piece of clothing to check. Contrary to what you might think the scrub board worked so well that it was never a matter of slaving over it. Ten or twenty vigorous scrubs and the stain was gone. It was hard work, maybe it would have been easier with modern laundry detergent or borax or the many other chemical listed but we didn’t have them and couldn’t afford them. This booklet brought back memories of my mother doing our family laundry in the late 30s, doing laundry my own laundry, by hand, while in Marine Corps boot camp in the early 50s, laundry equipment shown in my copy of the 1908 Sears catalog, and a display of late 1890’s/early 1900s laundry equipment at a local historical museum. Laundry as done by my mother in the 30s and the ladies at the turn of the century was done for 3 purposes. It was to not only make the stuff clean and sanitary but, perhaps more importantly, to make the clothing look “pretty” so other ladies wouldn’t think poorly of them. Laundry as done by USMC recruits, by hand, in the early 50s focused only on clean and sanitary. During a Zombie Apocalypse situation doing what was done by the ladies in the early 1900s would be way too much time consuming as well as wasteful or other resources. If the laundry is done to simply make the clothes clean and sanitary then things such as bluing, starch, and ironing are wasteful. Stain removal is probably a useless enterprise. What we did in boot camp would be far more appropriate. In boot camp our laundry facility consisted of a table whose top was made of 2×6 boards with ½” gaps between the boards, a cold water spigot, a metal bucket, a stiff bristle brush, a bar of hard soap (perhaps Fels Naptha), a clothes line, and clothes pins. The table was located on a concrete slab with a waste water drain. We would spread out our dirty garments on the table, slop some water onto them, dip our brush into the water in the bucket, rub some soap into the brush, and then vigorously brush all parts of the garments with the soapy brush. We would then slop on more water, brush some more with out soap until the water no longer produced suds. The garments were now “clean”. We would then take the garments, hand wring out the excess water, and hang them on the cloths line in the full sun until they were dry. They were now fit to be worn again. And, yes the DIs (drill instructors) would later evaluate the quality of our cleaning endeavors and prescribe additional laundry instructions and practice as appropriate. One additional thing, for some situations you may want to add a sanitizing agent to your wash water (bleach). You might also boil some clothes in a canning kettle or similar container as my mother did in the 30s when she had sick children or dirty diapers. Just remember, large container of hot water can be hazardous if spilled and heating water consumes lots of precious fuel. Now, having said this, a good prepper would be well advised to consider the wisdom of having a good supply of clothing that lends itself to doing this type of primitive laundry, designing your laundry facility with appropriate waste water drains, and practicing doing laundry by primitive methods – especially during the cold and rainy seasons of the year. 2. laundry methods used by his mother at an age, probably well under 40 and so still possessing healthy wrists and tendons, when she had young children. He does not specify what technology she had. But he prefers (1), for reasons that he gives. However at SHTF, the goal has to be to find non-electrical labour saving devices for laundry, and not to maximise wear and tear on wrists, fingers, backs, elbows with the “young guy” USMC method. 1. those with “non-USMC” and possibly rheumatic joints will have to do laundry, especially as older people may become more house-bound due to lack of mobility devices such as golf-cart type vehicles, etc. The house-bound are predestined for domestic tasks in a survival group with a division of labour based on gender and age. But it is exactly those older people who cannot handle intensive manual labour any more. 2. at SHTF, life will contain much more physical labour than it does in rich countries in 2013. So even USMC will be happy to reserve muscle power for tasks for which there are no labour-saving devices at all. 2. plastic-egg-type manual washers such as Wonder Wash.
4. manual laundry plungers to agitate the laundry from above. Around 1900, these were made of brass and had holes in them to allow water in and out. Youtube shows various devices such as bicycle-driven washers (Guatemala) and the Giradora, which may go into production soon. Laundry is heavily underestimated as a manual chore and preppers just have to find non-electric manual solutions before SHTF. I’m now 81. And, yes, I can’t do as many of the same things as I did 60 years ago. BUT, even with damaged wrist and elbow joints and a bad back, I can still (albeit slower than before)wield a scrub brush and wring water from wet clothing and can (and do) cut my own fire wood for home heating and cooking and , if necessary, heat laundry water. I have no quarrel with using hand powered machines to do laundry chores such as wringers, etc. BUT, these are expensive and many folks can’t afford them. Most of these are young folks. by the methods I describe. But, the majority of folks can. I simply present another option for folks to consider. I make no claim that what I describe is the best option for all folks. I didn’t say that my mother did her laundry by hand – she didn’t. She had an electric powered Maytag agitator washer with wringer. I did describe how she sanitized some laundry items by boiling them in a large kettle on the kitchen range (which was electric). The same thing could be done in a kettle over an open fire. “Adapt, improvise, and overcome” still works for old folks. I don’t see any numbers. If you put a stopwatch on how long it takes Lima slum dweller women to do the laundry for their family by USMC “manual. young guy” methods, they are working at it for 6, repeat six, hours per day. That, plus wear and tear on the female body, is why the Giradora is being developed at a price to suit Lima slum dwellers. I envisage people in a grid-down SHTF cutting corners where they can: getting food, water and security will be the priority, people will be too tired to look after hygiene and will thus die. It always happens, which is why refugee relief organisations are researching how to provide better sanitation in refugee camps. That is why any hand-driven washing/drying machine to save time and effort at SHTF is highly valuable. AR15s are more exciting but illness always kills more people. You are right to say that a manual wringer is expensive in CONUS: Lehmans models are both over USD 100. But maybe the problem of spin-drying can be solved cheaply with high-speed manual rotation using a bicycle drive. That requires an old bicycle and a washing drum container; Youtube has a Guatemala video on this. I haven’t built it yet. I myself own and use the “end-over-end spinning-egg” Wonder Wash. In CONUS it costs USD 39.90, which does not break the bank even of young people. Let me tell you that it is no effort at all to wash 5 lbs of clothes in hot water using a rotary handle for a few minutes compared to doing it by hand. The cold water rinse is only 30 seconds. Youtube has a video, I believe by Southern Prepper, in which he demonstrates a washing setup consisting of 2 plastic buckets, probably 20 litre ie 5 gallons, and lids with holes in them through which he inserts manual agitator plungers. Bucket 1 is hot wash, Bucket 2 is rinse. Jeesh, Cooler, Hangtown Frank was just giving us his version, just as you gave yours. Don’t be such a poor sport that you can’t see there are a variety of options, and that there is isn’t just ONE right way to do it! Thanks to BOTH of you for other options. And, Semper fi, H.F., my daughter is a retired Marine (11 years, only got out because she was disabled. 90%) having served in Iraq.